Meet six alumni who’ve combined their expert clinical skills with an intrepid entrepreneurial spirit to blaze their own trails. They are some of occupational therapy’s big thinkers. They are risk takers. They are innovators. Where others zig — for example, the more than 60 percent of OTs who choose to practice in hospitals, long-term and skilled nursing facilities and schools, according to the 2015 AOTA Salary and Workforce Survey — these intrepid few zag, finding new, exciting ways to practice occupational therapy or incorporate their expertise into other industries altogether. Many work long hours, sometimes juggling two or three job commitments to make sure their dream of business ownership comes true. And they do it all with entrepreneurial spirit. Meet just a few of the alumni who have taken the expert clinical and research skills they’ve gained at USC Chan and forged their own path toward a career of their dreams in occupational therapy. Sitting across from her banker’s desk, Barb Phillips notices him typing on an unsteady keyboard. Politely she stops him and flips out the other leg of the keyboard. These are exactly the types of recommendations that Phillips makes for people through her business Ergo Life Solutions. The self-described career problem solver created a business out of helping people get out of pain and back to work. Her occupational therapy journey didn’t start in ergonomics, though. Phillips moved to Southern California in 1993 to work at Rancho Los Amigos National Rehabilitation Center, where she was introduced to and later took part in Florence Clark’s Lifestyle Redesign pilot class in 2001. Phillips was accepted into the division’s OTD program in 2008. During her program, she worked for the City of Los Angeles, where she set up the ergonomic program. 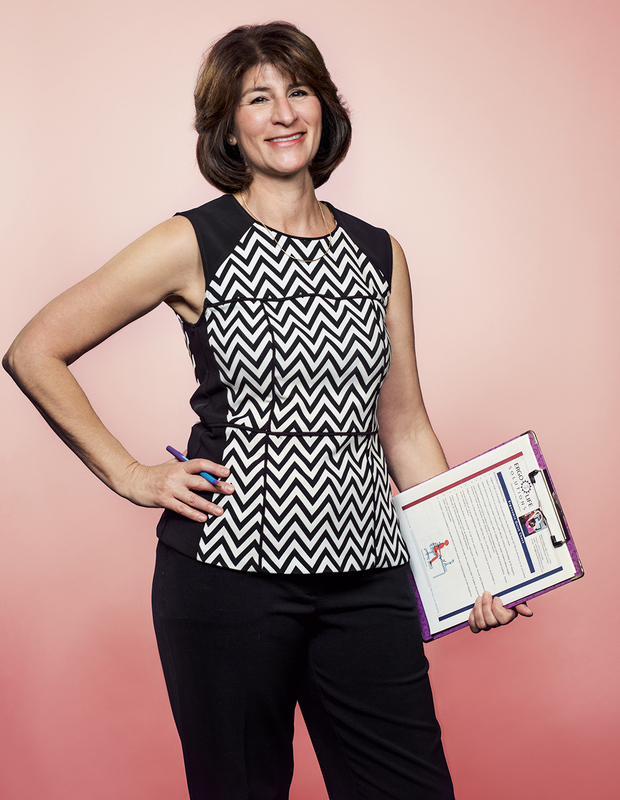 In 2012, Phillips left her job with the city and launched Ergo Life Solutions. With her new business up and running, she was finally able to use her skills in compassionate care to listen to her clients and observe their situations as an ergonomic consultant. She’s also been known to use old books to prop up computer monitors or to duct tape stuffed animals to chairs as cushioned armrests. Phillips credits much of her success back to what was ingrained in her at the division. For months, Erika Salgado experienced pain radiating from her shoulders to her lower back. To ease the pain, the human resources executive would try to adjust her workspace, but she continued to feel discomfort. Salgado’s employer, Pankow Builders, offered her an ergonomic consultation with Barb Phillips, who did a complete evaluation of Salgado’s workplace, including position measurements of her computer screens, phone, printer and chair. 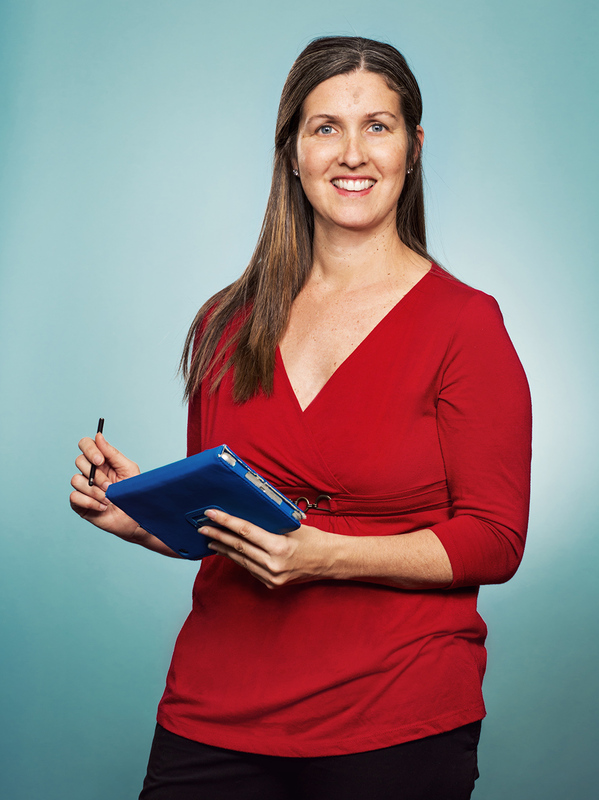 Charissa (Shaw) Sims MA ’00 had a stable career working as an in-house ergonomics specialist for Corporate America when she realized she had much more to offer her clients with her clinical skills as an occupational therapist. This professional epiphany led her to start her own ergonomics consulting business called Ergolution. When Sims was applying to occupational therapy schools, she didn’t realize the myriad opportunities the profession had to offer. Sims got in touch with local ergonomics consultants in Southern California and asked to shadow them. Soon after, she landed her first job at UCLA Ergonomics, where she worked for six months. It was during her next job at Raytheon, where she worked from 2002 to 2004, that Sims realized the clinical and leadership skills gained at USC Chan were being underutilized. She launched Ergolution in 2003, with her first and long-standing client City of Hope coming to her through a referral from one of the chair vendors she had previously worked with. These days Sims gets new clients through a bid process or referrals. She also uses her website and social media sites such as LinkedIn and Maven as tools to gain new business. As CEO of Ergolution, Sims not only runs business development, but she also works with her clients directly by providing ergonomic program management, software and training. She also does workplace evaluations, making recommendations on tools or furniture modifications, such as new chairs or work equipment. “Working with clients from industrial settings is very different than clients in office settings, and many of the recommendations are customized and unique,” she says of her constantly growing client base. Sims has worked with everyone from truck drivers to insurance brokers, but she says, despite their different vocations, their discomfort tends to be the same. While she admits running a business has its challenges, to her, the benefits outweigh the negatives. Pursuing her entrepreneurial endeavor has given her more time for family and the additional flexibility to pursue other opportunities. Sims believes being interested and inspired by your work helps during those tough times as a small business owner. “Everything is hard; even having a regular job. It is part of life and it makes you a better person through the struggle,” she says. Amber Bill was a new employee at the City of Hope Medical Center when the employer contracted Sims to conduct ergonomic interventions for its employees. Sims worked closely with Bill — not only to do an ergonomic evaluation of her office space but also to help the new assistant director establish a long-lasting program at City of Hope. “Charissa helped fill a gap in our company by providing ergonomic assessment needs for our staff in locations hard for us to logistically get to,” Bill says. Deann Kato ’68’s goal was simple: She wanted to be able to sit on the floor and play with her 4-year-old grandson for 30 minutes. 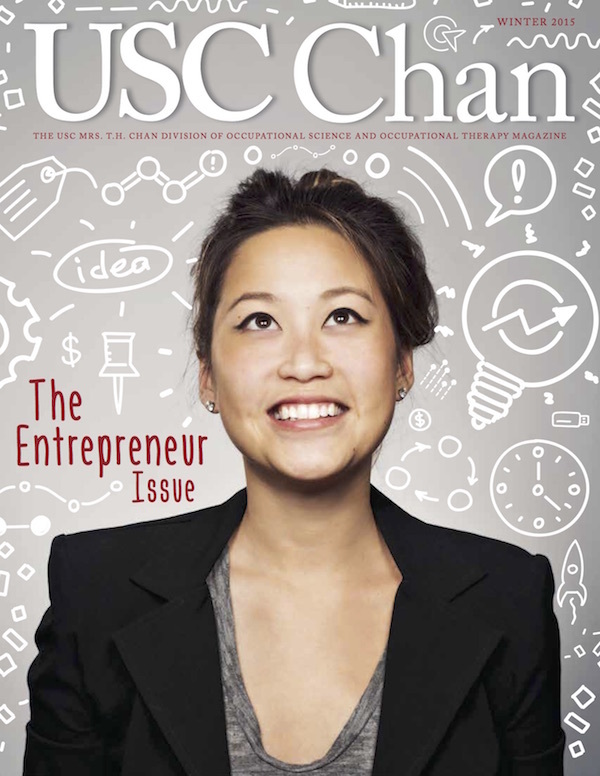 The once incredibly active 68-year-old retiree, who had been suffering from chronic neck and back pain and had undergone cervical lumbar fusions, approached USC Chan alumna and new business owner Jessica May Tang MA ’13 to help her achieve this rather modest goal. Part life coach and part occupational therapist, Tang guided Kato toward her objective through one-on-one at-home sessions. Together, the two set up an exercise and stretching program, discussed activity pacing and energy conservation strategies and even worked on fall prevention techniques and pain management. With Tang’s help, Kato eventually played on the floor with her grandson for 45 minutes. Effecting this type of lifestyle change was precisely what Tang envisioned when she started her own business Damon Lifestyle Consulting earlier this year. 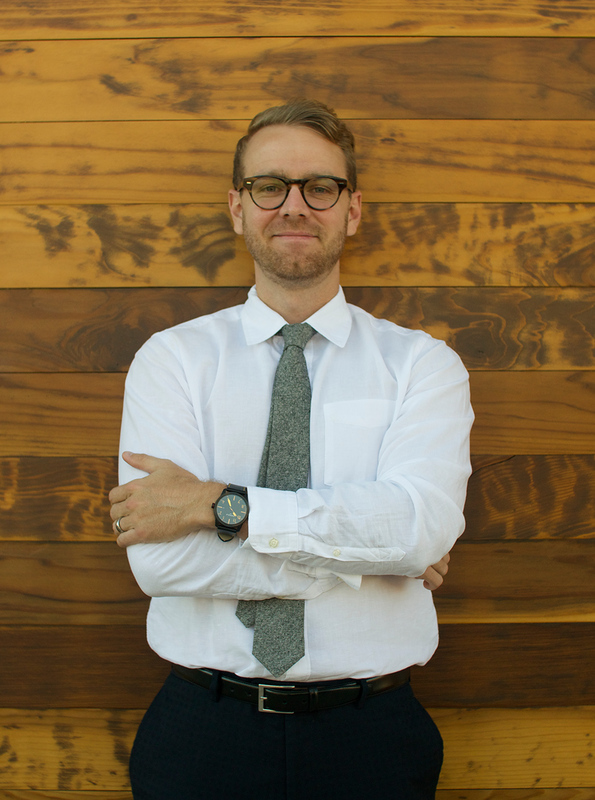 The burgeoning business, which serves clients across Southern California, aims “to assist individuals in creating healthy habits, routines and goals toward living their best lives,” according to its website. Through her business, Tang works with clients to create personalized treatment plans for everything from stress and anxiety management to caregiver support to pain management. A case starts with a free 15-minute consultation — typically in the would-be client’s home. From there, Tang charges anywhere from $50 to $150 a session, depending on the number of sessions the client purchases. Still in her first year of business ownership, Tang admits its not been an easy road. “Let’s just say the easiest part was getting the DBA,” she jokes, referring to registering the company’s legal name. Learning how to write a business plan, how to market something as unknown to lay audiences as occupational therapy and how to finance a small business have presented Tang, a self-described life-long learner, a steep learning curve. She thinks these skills should be taught in an elective course during one’s occupational therapy education. “I think that would be an interesting elective to have at USC in case you’re interested in going out and starting a small business,” she says. Though, with less than 10 percent of occupational therapists opening their own practices, the course could be a hard sell for most programs. While Tang grows her business, she’s had to continue working part-time at a hospital and an outpatient clinic. But she says the satisfaction of seeing her clients’ epiphanies about their lives helps fulfill her through those long days. “Whenever someone has an ‘Aha!’ moment about how they’ve been looking at their life or when they realize there’s so much they can do and how much control they have over their lives to change, that’s very satisfying,” she says. 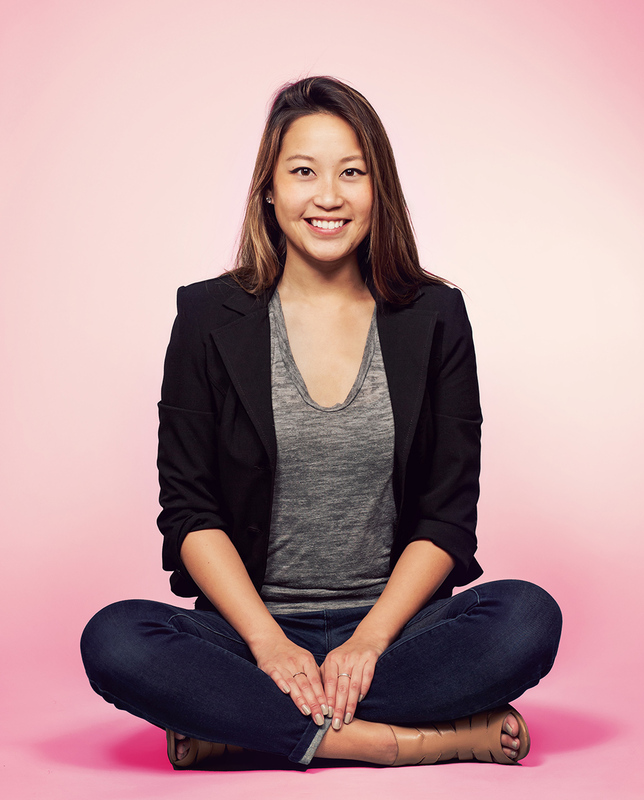 Having seen her mother’s success with Damon Lifestyle Consulting, Allison Kato MBA ’09 — daughter of Deann, the 68-year-old grandmother who sought to play with her grandson despite her back pain — purchased a session with Jessica May Tang to help her and her husband deal with their own chronic low back problems. “I was surprised at how effective Jessica was at identifying the root cause of my pain,” says Allison, 36, who was 5 months pregnant when Jessica visited the couple’s home to see how they interact with their environment. “She suggested exercises and adjustments to our posture that have made a big impact on our day to day life,” Allison says. When Sean Sullivan MA ’13 launched Dollar Safety Network in early 2015, he knew that flexibility would be integral to realizing his business goals. As he surveyed the community, Sullivan identified a gap between the concentrated populations of older adults who actively consume health care services and those who don’t. That gap is a substantial one: According to 2012 data from the Agency for Healthcare Research and Quality’s Medical Expenditure Panel Survey, the top 5 percent of health care consumers in the Medicare population are responsible for 38 percent of total spending. “I saw a potential middle market — a wife or a husband, a mother or a father, who doesn’t have many immediate needs but is legitimately concerned about their long-term ability to age successfully and at home,” Sullivan says. That concern likely reflects older adults’ overwhelming preference for aging at home. A 2010 survey conducted by the American Association of Retired Persons found that 88 percent of respondents age 65 and older want to remain in their current place of residence for as long as possible. Sullivan started Dollar Safety Network with the goal of empowering his clients to lead safer, more satisfying lives in their own homes. For the price of one dollar per day for an annual membership to Dollar Safety Network, the Orange County-based Sullivan visits customers in their home and leads them through a comprehensive evaluation aimed at analyzing their specific degrees of risk exposure. “I learned to code and build algorithms well enough to develop a digital risk assessment tool that measures 300 discrete threats to a person’s health and safety,” Sullivan says. Categories of risk analysis include health history, physiology, cognition, environment, support availability, post-surgical and illness specific risks and activities of daily living. During the assessment, clients complete brief interviews and demonstrations and participate in interactive games including digital apps. Knowing those targeted risk areas, Sullivan then provides clients with individualized education, equipment, community resources and easy-to-understand strategies that can decrease their overall degree of risk exposure. Solutions can be as intuitive as suggesting kitchen tools that compensate for decreased grip strength while cooking, or as involved as bringing a contractor into a client’s home for renovations. Sullivan also provides traditional home health occupational therapy services. “I think of myself as a matchmaker to help people get the services that they need,” Sullivan says. And his services are in demand. Since hanging his own shingle in early 2015, Dollar Safety Network has been growing at approximately 17 percent each month. The young entrepreneur has also learned crucial business lessons along the way, chief among them the importance of sustainable, organic growth. What Sullivan has indeed found is a business model that not only works but makes substantive improvements in the everyday lives of people in his community. No matter what hat he wears on any given day, Sullivan’s passion for assisting others is tangible. Imagine you’re a 27-year-old man whose life has been forever changed after a car accident left you with a spinal cord injury. If you choose to remain in your home, there will need to be some modifications made — entry ramps added, hallways widened, showers made for wheelchair accessibility — so you can navigate daily life in a wheelchair. At this point, you might Google a good local contractor to redesign your living space, which is what one of Thrive for Life LLC’s Maui-based clients did recently to give him greater autonomy in his bathroom. Garell explains that the client often felt lightheaded after using the bathroom and needed to have his legs elevated while showering — something the contractor didn’t know and the client didn’t think to share. The contractor had built the shower without enough space for the client’s legs to be elevated. 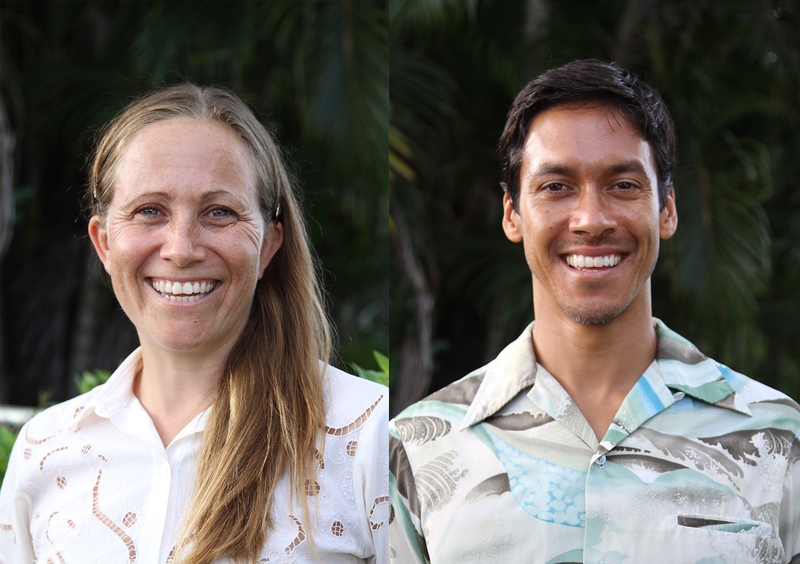 Home modifications made with the expertise of an occupational therapist is the business of USC Chan alumni Garell and Damian Sempio ’01, who in 2011 started Thrive for Life LLC, which serves the entire state of Hawaii. Through Thrive for Life, Garell and Sempio have helped individuals ranging from medically fragile children to young adults who’ve suffered catastrophic accidents to elderly individuals, all of whom need guidance through the process of home modification. The small business’ goal is “to simply modify your home environment so you and your loved ones can comfortably ‘age in place’ for the rest of their lives,” according to its website, thriveforlife.com. The process starts with an assessment, where Garell and Sempio meet the clients and their caregivers. They look at the client’s medical history, take measurements and assess the client’s daily tasks, specifically focusing on areas where they might face barriers. While their clients range in age, one particular area of interest for Garell and Sempio is the elderly. With the U.S. census projecting the number of elderly in America to double by 2050 and the annual price of a nursing home in Hawaii exceeding $150,000, Garell and Sempio saw a need. They wanted to help ensure more elderly individuals could stay in their own homes instead of having to transition into assisted living environments. Both Garell and Sempio have Certified Aging in Place Specialist designations as well as Executive Certifications in Home Modification from the USC Davis School of Gerontology. Once the team — comprised of draftsmen, designers and contractors — has gathered the information needed, they detail a few construction concepts for the client and their family to choose from. After a plan is selected, Garell and Sempio guide their clients through the process from collecting contractor bids to filing the appropriate paperwork for permits to conducting a comprehensive post-construction assessment where they watch their client in their new space. “Clients often come back to us and say it’s been a life-changing experience for them, and that it’s improved their quality of life,” Garell says. “There’s a sense of satisfaction in being able to design something that creates this huge smile and makes the families safer and the homes more accessible for everyone,” Sempio adds. Bath time for Ryan Cadirao used to be a real challenge. A narrow bathroom door and cramped layout left his caregivers little choice but to lift the 15-year-old with mitochrondrial myopathy from his wheelchair, carry him inside and, while balancing on one foot, shut the door behind them with the other. “It got to a point where carrying him became too difficult,” explains his mother Caroline Cadirao, who hired Thrive for Life to oversee home modifications to make the home more accessible.